GACK. Guitar accessory carrying case for music, footstool, music stand, etc. The world's one-and-only Guitar Accessory Carrying Case! Voice-over: "Has this ever happened to you...?" Voice-over: "This need never happen to you again. To order your very own Guitar Accessory Carrying Kase, grab your credit card and call 1-800-GTR-GACK now. Not available in stores. Hurry, this offer will not last!" Missed that one, eh? Actually, I made it up. The commercial, that is. The GACK is real, even if only one-of-a-kind. As soon as I attended my first guitar workshop, I saw a need for a convenient way to carry around all the "other stuff" a guitarist needs. Sure, there are ways of making do. You can toss it all in a canvas bag, for example. And if you're the sort who worries about the music stand ripping up the music, or the footstool smashing the quartz tuner, you can resign yourself to wrapping everything up individually before throwing it all together. I took measurements of all my guitar paraphernalia, designed a "guitar accessory carrying case" that had a separate, instantly accessible compartment for each item, and had my father build it out of wood. It took him 10 minutes. Actually, he made two in 10 minutes. The first was ruined when the power saw hit a nail while cutting the lid off. Thanks, Pop! 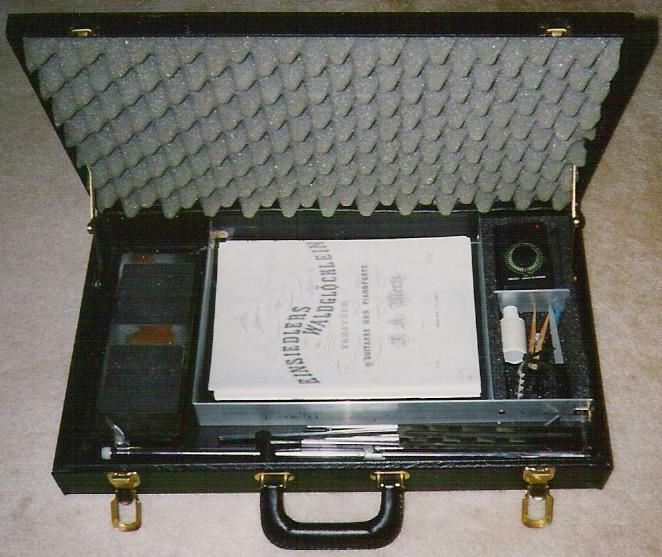 Besides compartments for the music, music stand and footstool, this first Gack had a padded compartment for the metronome and another compartment for odds and ends - pens, white-out, nail file, sandpaper, capo, music-page-holders a.k.a. clothespins, etc. My Gack became an instant "necessity" and served me faithfully for about 8 years. It seemed that most people, though, viewed it with bemusement, apparently having trouble appreciating its obvious indispensability. In spite of that I figured, "Surely, there are lots of other guitarists on the go - I can't be the only one who needs something like this." I began to look into having it commercially produced. A bit of searching at the U.S. patent office seemed to indicate that special-purpose carrying cases are hardly ever patented - I suspect because such a patent would be very easy to get around. The results of a modest marketing study were not too clear. Almost everyone who responded said they were "interested" or "very interested" in the Gack, but only a small percentage had responded. Most people were content to just steam the postage stamp off of my return SASE - a real goldmine, huh? A case manufacturer, Howe Industries, constructed a prototype for me. They did this amazingly inexpensively and the finished product turned out very nice. A common assumption is that my Gack is a converted briefcase. In fact, no briefcase on the market is anywhere near large enough. The biggest improvement over the original wooden model is the convertability of the two smallest compartments. A movable divider allows you to set up one or two compartments and adjust the size of the largest to fit your own equipment. Also, the entire inner top is foam-padded. While this isn't a necessity for the non-electronic items, it helps to secure everything and eliminates clanking. A. Music. Holds virtually all publication sizes. B.  Folding wire music stand. D.  Padded for quartz tuner. E.  Padded for quartz metronome. Partition between D and E can be moved or removed. Stop the press! Five or six years after first putting up this page (writing in Sep 2004), I can now put up a real picture of the thing! As it stands now, I have no intention of trying to market the Gack. The biggest outstanding problems are expense and weight. What one would have to charge to make any sort of profit on it, the typical guitarist probably wouldn't want to pay. And ideally, it should be made of injection molded plastic to minimize the weight. The set-up costs for that would be prohibitive, however. But, I've got a Gack for me, and you'all'll have to suffer, I guess. Oh yeah, and a pox on all of the houses of that guy who, in response to the survey question, "Is the name Gack ok?" wrote back, "It sounds like somebody's sick." Helpful keywords not in the main text: sase = self-addressed stamped envelope.